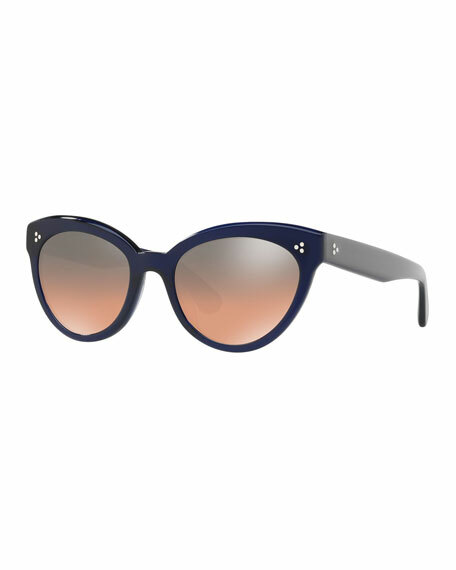 Oliver Peoples "Roella" cat-eye sunglasses in acetate. Pin detail at temples and frame front. Fendi round sunglasses in metal. Lens/bridge/temple (in mm): 52-20-145. Mirrored lenses. Double nose bridge. Straight brow bar. Adjustable nose pads. Linda Farrow cat-eye sunglasses. Lens/bridge/temple (in mm): 59-20-135. Lightweight titanium with 22-karat, yellow gold plating. Detached, open-inset temples. Platinum-coated vaporized Cridalon® lenses. Adjustable nose pads for added comfort. Slim temples with Japanese bulb tips. Can be fitted with prescription lenses. 100% UVA/UVB protection. Made in Japan.